The Gunfighters Motorcycle Club™ is a fraternal organization consisting of active and retired law enforcement officers who share a passion for riding motorcycles. In the early days of western history, when the towns were lawless and life was cheap, the citizens needed men with courage who carried guns to tame the wild streets. These lawmen were recruited from the ranks of gunfighters that roamed the west. When no one else would step up to the task of bringing criminals to justice, these gunfighters did. They used guns as the tools of their trade. Hence, the original lawmen were born from Gunfighters. 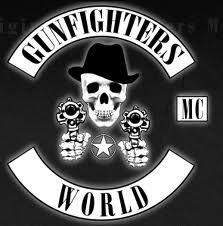 The Gunfighters Motorcycle Club™ was founded on December 10, 2005 by a group of active and retired law enforcement officers. These brilliant and insightful men joined together to celebrate our Brotherhood. We accept all cruisers, party with supporting clubs, and enjoy the brotherhood. That is the unbreakable bond that keeps us together. Some of our brothers who have joined our club are former members of other law enforcement motorcycle clubs. They formed special bonds while working side by side at Ground Zero during the rescue and recovery detail of 9/11 - a day none of us will ever forget. As GUNFIGHTERS and law enforcement officers, we will always remain faithful to the oaths we have taken to uphold the law and to serve the public. We are National and an International 100 percent law enforcement only club (LEMC). We are a LEMC club with chapters all over the world. Although we come from different law enforcement agencies, we are all one and the same. We are the GUNFIGHTERS.Click our CHAPTERS button to find a chapter near you. Click the EXECUTIVE OFFICERS button and contact one of the officers to see if you and/or your members qualify to create a new chapter in your area. Although our colors are black and white, we are all blue. Our patch is made up of several components that have specific meaning. Our black and white colors represent the early radio car colors. "Black & White" has become a widely familiar term in the law enforcement community. Many of the local police departments are returning to those faithful colors. The skull represents our undying respect for all law enforcement officers who have made the ultimate sacrifice. The hat represents the cover worn by the original gunfighters when they were paving the way for modern lawmen. The six-shooter guns represent the tools of our trade. Today's weapons are modern semi-auto, but our patch shows the six-shooter wheel guns the early gunfighters were armed with.